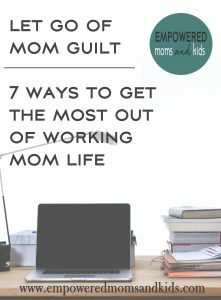 But when I’m struggling with prioritizing and my working mom guilt higher than the temps of a Texas summer, I remind myself of these 7 things. They help me get the most out of working mom life. 1. Be fully present where you are. 2. Examine what’s most important to your family and make it happen. My family values unpacking our thoughts together. So, dinner, old-fashioned card games, evening prayers, or other activities that promote communication are a must. Even if my day is slammed, if we’ve had time to talk as a family, I feel good. How can you prioritize the things that connect your family? If you don’t, you will crash. I promise you, it happened to me. Break the news: Sorry, I can’t commit. People will get over it. And don’t sign your kids up for everything. Look at your calendar and create margin. Your sanity will thank you. 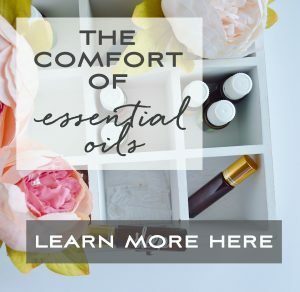 Do you want your daily life to be less hectic? 4. When you don’t have time, collect moments. Sometimes busy is best; everyone is involved in beloved activities and the schedule is held together by a thread. At those times, collect moments. Watch in slow motion as your son walks into practice. Linger in that hug with your daughter. Pause in your day and collect the blessing of the moment. It’ll fill your heart in ways you didn’t expect. 5. When your kids are communicating, stop and listen. Look up from the phone, quit chopping the vegetables, turn off the vacuum. 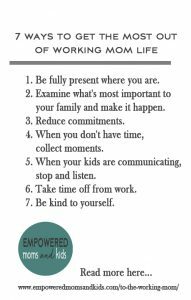 The to-do list will always be there, your kids won’t. And know they always feel the need to unload their hearts at the most inconvenient times. Roll with the waves on this one. 6. Take time off from work. I remember stressing about the number of sick days I used. A wiser coworker said, “That’s what they’re for. You have kids. They need you. Take more days if you must.” We get time off for a reason. Use it. The world will not stop. Life is happening right now, not tomorrow – live that way. We are our toughest critics, but we deserve the same grace we give other people. When you need time for you, take it. Create quiet moments to listen to your heart. Do whatever refuels and inspires you. Your household and workplace will benefit from it. 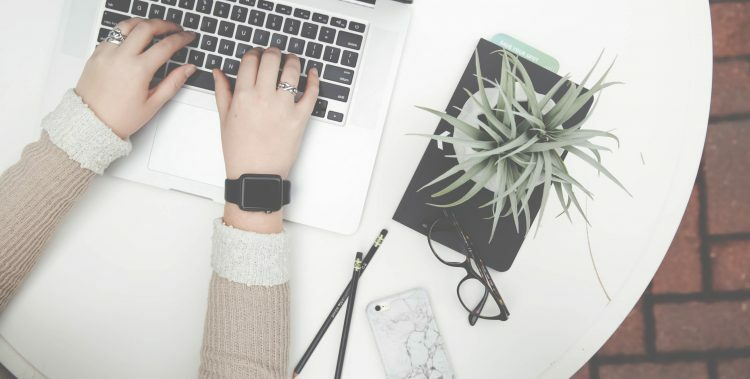 Do you want monthly empowerment but are too busy to seek it out? 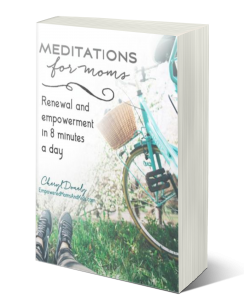 As a bonus, I’ll send straight to your inbox 2 free eBooks and the password to the Empowered Moms and Kids Resource Library. See all the helpful freebies in the library here. Yes, I want Empowering Freebies! 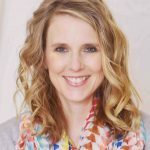 The Ministry of Motherhood: This book made me want to have 125 more children because Sally Clarkson left me feeling inspired as a mom. Settle For More: I am addicted to reading people’s stories. Megyn Kelly’s a strong woman whose determination is empowering. Own Your Life: I love Sally Clarkson. She shares her wealth of knowledge in loving and inspiring ways. She’s every mom’s cheerleader. 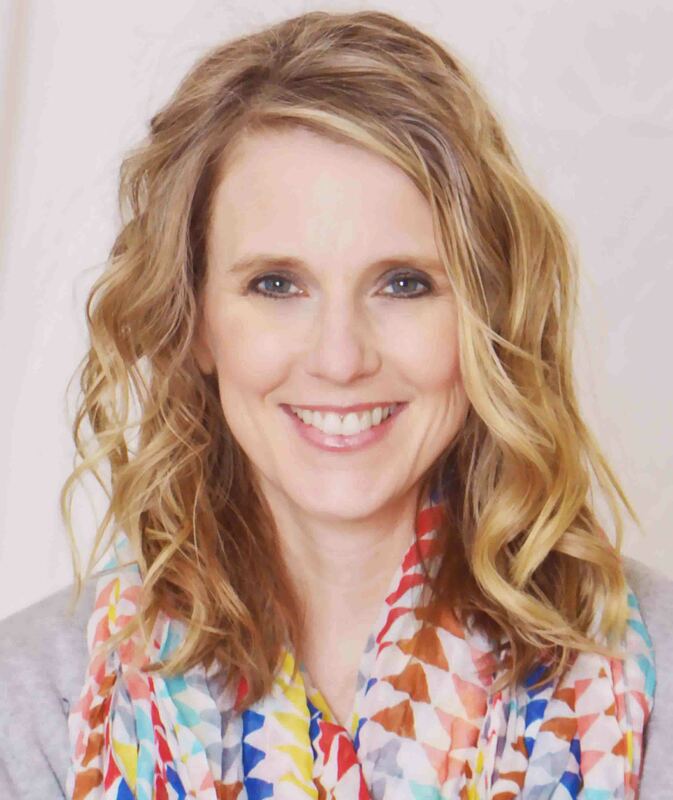 Breaking Up with Perfect: Amy Carroll helps us let go of perfect and reach for joy. Let. It. Go. : The title says it all. It’s a great read for all the type A’s out there. Plus, Karen Ehman is just fun. Savor: If you’re a tired mama – Shauna Niequest is your girl. I love her inspirational words that deepen our faith and help us live every day abundantly. If you have great reads for me, I’d love to see your recommendations in the comments. 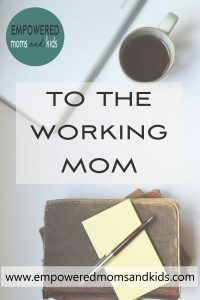 I've been a working-at-a-job mom for almost 18 years. 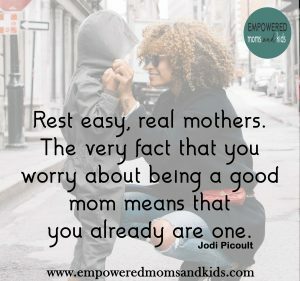 (Every mom is a working mom.) It is SO HARD. Thanks for the reminders…especially important is to reduce commitments. 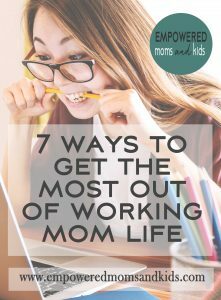 I work at home, so I am tempted to behave like a stay-at-home (working) mom with my volunteering. I really can't do that. Some of the best times I have with my kids are when we are in the car on the way somewhere. I find that is when they really open up and talk. My kids open up and chat in the car as well. 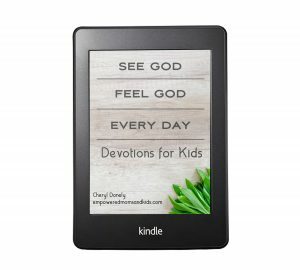 Sometimes, I think I have to be sitting with my kid over a cup of hot chocolate to connect, then I realize car rides can be sacred moments as well!